Developed on the racetrack. Built for the road. The beast of the Green Hell. 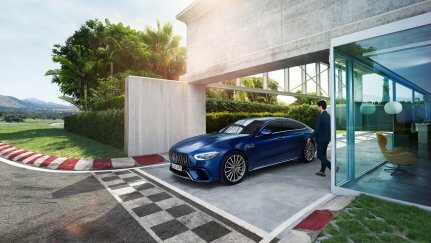 The Mercedes-AMG GT R demonstrates AMG's development and racing expertise and pushes the limits of dynamic driving even further - making the AMG DNA even more enjoyable. Thanks to direct know-how transfer from motorsport, the Mercedes-AMG GT R impresses with a top speed of 318 km / h and acceleration from 0 to 100 km / h in 3.6 seconds. The Beast of the Green Hell. The Side Design shows the outstanding dynamics. The powerful Front-End Design hints at the performance of the engine. Optional AMG Ceramic High-Performance Composite Brake system. Selectable AMG Performance Exhaust System. The AMG Performance exhaust system with flap control combines a formidable sound with low weight. It turns the performance of your vehicle into an intense acoustic experience and also contributes to this performance itself with lightweight titanium components. The large, centrally positioned tailpipe trim element and the two outer tailpipes emphasize the affinity with the world of motorsport. AMG forged wheels in 10-spoke design, black matte finish and rim flange with high-grade finish, with FA 275/35 ZR 19 on 10 J x 19 ET 56, RA 325/30 ZR 20 on 12 J x 20 ET 52. Building on the extensive standard equipment, the Mercedes-AMG GT R Coupé offers numerous options for customizing the exterior. 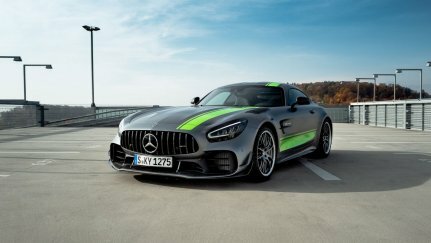 High-performance material meets high-performance car: the carbon-fiber elements for the exterior underline the sporty character of your Mercedes-AMG GT R, and lend your vehicle an even more sporty and technologically advanced look. The benefits of the material from the world of motorsport, namely high strength combined with low weight, are a perfect match for the AMG philosophy. The AMG Exterior Carbon-Fiber package II completes the sporting high-tech appearance of your vehicle. The additional carbon elements are particularly striking: the exterior mirror housings and the fixed rear wing in carbon leave an impression from every perspective. AMG Performance Steering Wheel in Black DINAMICA Microfiber. This AMG steering wheel is consistently designed in a grippy DINAMICA microfiber - for perfect grip and precise steering. The AMG signature flattened form comes from motorsport and emphasizes the sportiness of the cockpit. Ergonomically positioned touch-control buttons offer intuitive ease of use and promote focused driving. With the AMG steering wheel buttons you can make your steering wheel radically sporty: These allow fast and accurate operation of specific driving dynamics functions. For a focused, concentrated and performance-oriented driving experience - and for an authentic racing car atmosphere in the cockpit. Optimum lateral support meets minimal weight: with the AMG bucket seats, you can take pole position in the first row. Featuring manual fore/aft adjustment, the bucket seats are significantly lighter than conventional seats courtesy of their intelligent lightweight construction. Thanks to the high side bolsters, they offer first-class lateral support when adopting a very sporty driving style. The control and display concept of the Mercedes-AMG GT Coupé has been expanded to include a number of innovative elements. Touch-control buttons on the steering wheel and high-resolution displays set the standard in the segment. The digital displays and animations on the instrument and media display make vehicle functions easier to experience. Familiar strengths such as the intuitively understandable operating philosophy and the high legibility of all displays have been further enhanced. The AMG SPEEDSHIFT DCT 7G impresses with rapid shift times, emotional declutching and performance on racing level; the sportier the mode, the more agile the response. Small differences in engine speed allow optimal translation adjustment and fast gear changes without any interruption. Seven gears, three driving modes and a manual mode as well as double-declutching and RACE START functions enable extremely dynamic acceleration maneuvers.